A popular misconception I have noticed is that ground attack aircraft were used successfully as “tank-busters” of “tank-killers”, and that aircraft were seemingly the largest threat to tanks. I know some of you don’t think this, but I think a good portion of you might. I will focus my attention on the AT abilities of the Hawker Typhoon and the P-47 Thunderbolt against German armor. I will also quickly go over examples from the Eastern Front. In NW Europe the Typhoon and the P-47 are regarded as an effective weapon against German Armor. CAS pilots claimed hundreds of panzers dead due to their bombs, rockets, and cannons. The problem is that this just isn’t true. During my time wasting time on the internet I ran across this gem. Below is a seminar given to MIT by Col. Robert Doughty, former head of the Dept. of History of the US Military Academy, on the “Myth” of Blitzkrieg. I found it rather interesting and felt compelled to share this with you all. The 1940 German campaign against France and the concept of blitzkrieg have exerted a powerful influence over modern perceptions of warfare. The 1940 campaign is frequently cited in discussions of strategy and operations and in publications about the “Revolution in Military Affairs” (RMA). Proponents of the RMA have argued that blitzkrieg was the product of technological and conceptual advances during the interwar period. They have also claimed that the 1940 campaign demonstrates how such advances can quickly change the conduct of warfare. So far in WoT there is a total of two premium artillery pieces, however most nations can easily be given a premium arty. America had been at the forefront of SPG development up until recently and could easily have a second SPG branch in WoT, but that is for another article. Today I’d like to showcase the XM104. 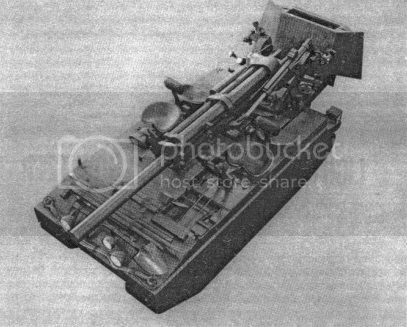 The XM104 was a very small vehicle(4.06 m long–including the gun & shovel/spade, 1.75 m wide, and 1.75 m tall) which weighed ~3.9 metric tons. We are talking about a vehicle with similar dimensions to the UE 57. It was developed in the early 1960s as a light, air-mobile, and amphibious artillery piece. Unsurprisingly, the XM104 did not have any armor to speak of besides a supposed variant with a gun shield. The XM104 had a 66 hp M151 engine which could propel the vehicle to speeds of 56 km/h. The XM104 had a crew of 4. 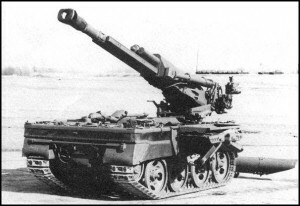 The main gun on the XM104 was the XM103 105 mm howitzer, which was used in the M108 SPG. The earlier trial model mounted a vintage M2A1 105 mm howitzer, which is in all practicality the same gun as the M37′s top M4 105 mm howitzer. Either weapon would work in WoT, it would be WG’s discretion on which to use. 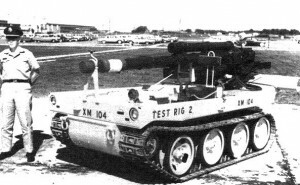 The XM104 was eventually cancelled and never saw wide spread production. Their were a number of faults with the machine which includes exposing the crew to unsafe levels of CO to being armed with a caliber that was quickly falling out of favor. 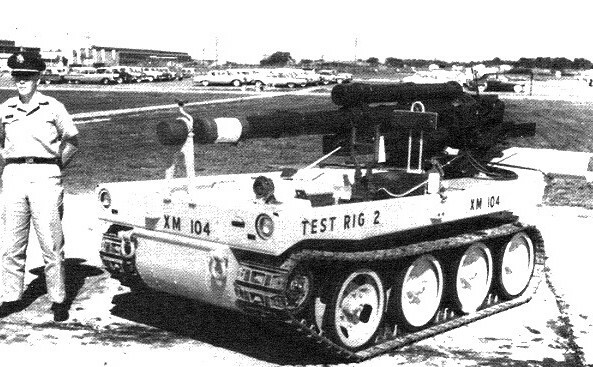 The XM104 was cancelled in the mid-1960s. I believe this vehicle is on display at Ft. Sill, OK. 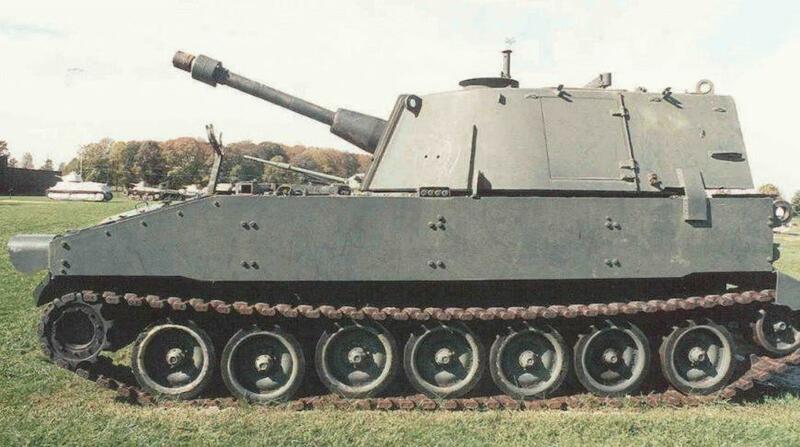 In WoT the XM104 would be a very good fit as a premium arty. It really doesn’t fit into a theoretical 2nd branch and is a near perfect vehicle for tier 5. WG can decide whether to use the M2A1 or M103 armed versions. Either way the XM104 would be a rather unique arty for WG to add to the game. Thanks StrelaCarbon(NA) for the idea for a XM104 Premium. Over 6000 American tanks were lost in the European Theater of Operation. Over 3000 British tanks were lost in Northern Europe and hundreds of Canadian and French tanks were lost after the D Day invasions until VE Day. Now what knocked out all these tanks. Almost naturally we think that German Panzers account for at least a majority of these losses, but that isn’t the case. Real combat isn’t like WoT, there are many other things besides tanks that fight and kill tanks. An American studies states that based off a sample of 12000+ Allied tank casualties from all theaters of WWII 54% of casualties were the result of gunfire. “Gunfire” includes tanks of course, but also includes AT Guns, StuGs, other SPGs, and artillery pieces. The incompleteness of records led to the report to only reference gunfire instead of breaking it down further into different percentages. The second biggest percent is AT mines at 20%. Noncombat reasons(being stuck in the mud, mechanical breakdown, etc.) was the 3rd highest cause at 13%. The figure of 13% is, in all likelihood, too low. 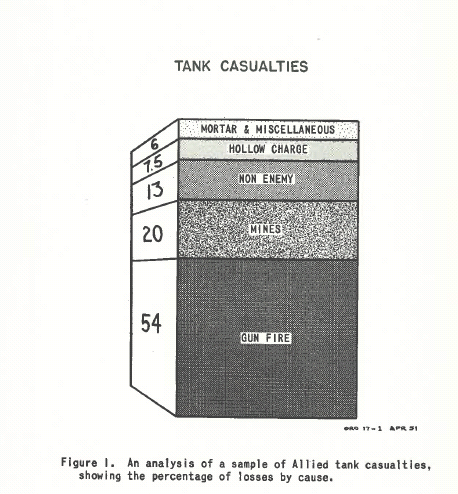 The US and British Armies were more concerned with weapon damage, the Canadian Army and the USMC recorded “more accurate” percentages of 25% to 40% of casualties attributed to noncombat reasons. Hollow Charge weapons like the panzerfaust were the 4th highest cause at 7.5 %. The remaining 6.5% was everything from mortars to aircraft to satchel charges. *A tank casualty/loss is a tank that is unavailable for movement in a battle area. More than half of all losses were repairable. 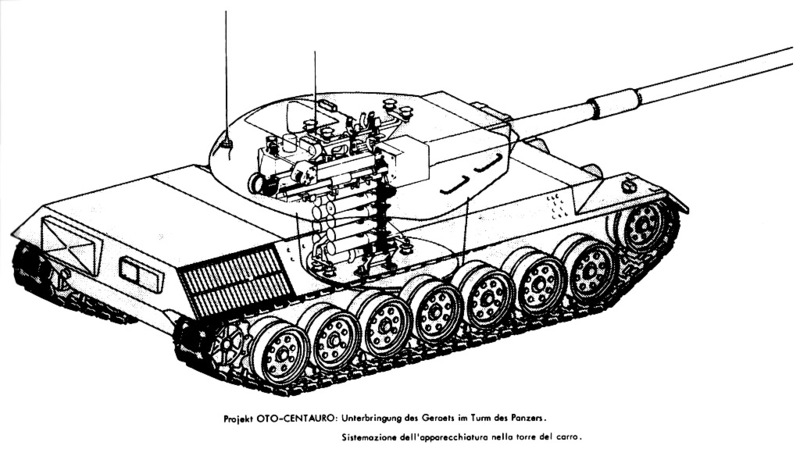 Yuri has posted this interesting diagram on his blog showing what seems to be an Italian Leopard 1 with an autoloading mechanism for the L7 105 mm gun. There is no date known for this project, named the OTO-Centauro, at the moment. Since this is an Italian it could be included into the Italian/Pan-Euro tree if it is ever implemented. On January 2nd, 1945 the US Army Ground Forces Equipment Review Board outline requirements for a new class of tanks, and on June 20th they reported that they suggest that American Armored Forces have a 25 ton light tank, a 45 ton medium tank, a 75 ton heavy assault tank, and wanted to research a 150 ton super heavy tank. In 1946, the Stilwell Board dropped the plans for the 150 ton vehicle along with tank destroyers and had American tank development loosely follow the requirements set forth by the AGF up until requirements changed in the year 1950. So first off lets discuss the 25t vehicle. 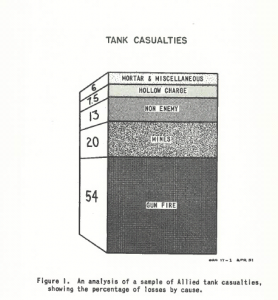 The AGF’s 25t tank was to replace the M24 which was inadequate, especially in the firepower department. The proposed gun was to be a 76 mm cannon that was to penetrate 127 mm @ 914 meters against a 30 deg. sloped plate. Mobility was also suppose to be better than the Chaffees. I actually mentioned this project before in this article, because the AGF’s 25t proposal quickly developed into the T37 and later into the M41 Walker Bulldog. 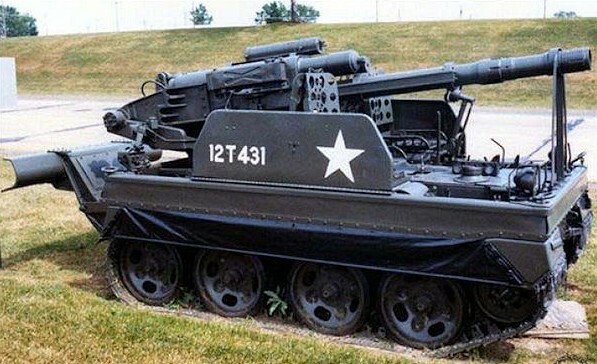 This particular vehicle, called the M4 90V by WG, was built in 1944 in order to have 90 mm armed tanks in order to give American tankers a weapon that could more easily defeat German armor. I have not found an official designation of this vehicle in my resources so I can only assume that WG’s name is acceptable. Recently I purchased Panzer Tracts 9-2 about the Jagdpanzer IV. I actually ordered 9-3 about the Jagdpanther, but any Panzer Tracts is a good read. I especially enjoyed the part naming controversy that might have screwed over the Jagdpanzer IV. Anyway, I noticed some discrepancies between the Jagdpanzer IV’s real life stats compared to the WoT version, nothing major but would be worth implementing. Recently I’ve run across a small little debate about what exactly was the M26 Pershing? Was it a heavy tank or a medium tank? This is a tricky question as it was technically both. That answer, even though correct, can be made more define. From what I’ve read, the M26 was a medium tank more than it was a heavy. On June 29th, 1944 the US Ordnance, who wanted a heavy tank to boost morale, redesignated the T26(M26)s as a heavy tank. Before this the T26 was a de facto medium tank that was developed from the T20 series of medium tanks. From June 29th, ’44 to the end of WWII the M26 kept its title as a heavy. After WWII the M26 was once again designated as a medium tank. This article is to debunk the myth of the Duel at Dessau, an engagement where the Super Pershing knocked out the Tiger II. So the story, told by gunner Cpl. J. Erwin, goes that the single T26E4 “Super Pershing” to see combat in the 3rd Armored Division was advancing into the city of Dessau on April 21, 1945. The T26E4 was the American “response” to the German Heavies, especially the Tiger II. By fate, the Super Pershing finds itself in a one-on-one shootout with a Tiger II in the streets of Dessau. The Tiger II fires first and misses then the T26E4 fires an HE shell and that just bounced off. “Something” hits the T26E4(making the reader assume that it was the Tiger II). The T26E4 then fires an AP shell that goes through the Tiger II’s underside and ammo racks it, making the turret fly off in the process. Now the closest recorded Tiger II units(SS 502) were ~70 miles from Dessau fighting the Soviets around Berlin. The Germans had fairly good documentation on the locations of their units throughout the war, so it would be extremely strange for them to lose track of a working Tiger II for no good reason and having it be 70+ miles from where it is suppose to be. Also it just seems more unlikely knowing that this engagement pits the rarest American tank to see combat with the rarest German panzer in a one vs one battle. American reports after Dessau also never mention any German tanks in Dessau and defiantly don’t mention anything about a Tiger II being knocked out by the “Super Pershing”. No other source mentions this engagement either. Irwin’s own account, in the book Another River, Another Town, also never states that the vehicle was specifically a Tiger II, rather just “Tiger”. A Tiger is a more plausible candidate, however it is also plausible that the vehicle could have been a Panther or even a humble Pz IV(which were commonly misidentified as Tigers). So in conclusion this story is a fictionalization and glorification of the T26E4′s action in Dessau. The vehicle destroyed on the 21st of April was more than likely a Pz IV misidentified as a Tiger. Later this snowballed into a Tiger II somehow in a retelling of the story by Irwin(outside of his book) and then picked up by the 3AD website because it is a neat little fairytale. I guess Super Pershing vs. King Tiger is more interesting than T26E4 vs Pz IV.